A few years ago, my youngest daughter made me a beautiful flower as a Mother’s Day gift in school. I have moved that precious flower three times and still treasure it. 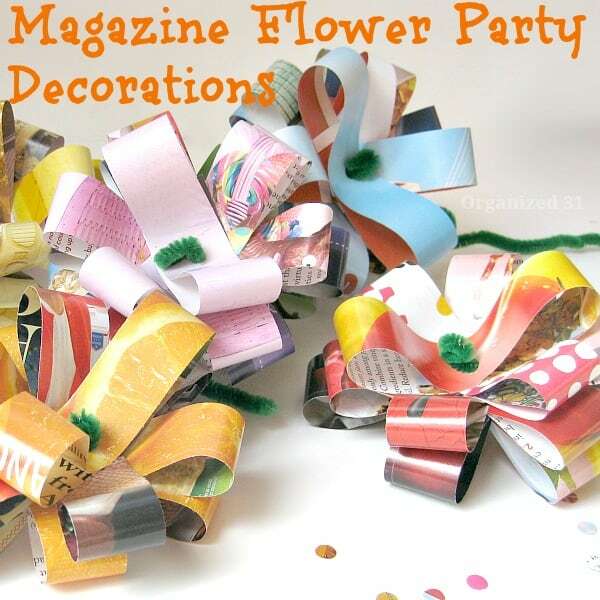 These easy magazine flowers are a fun quick project to make for party decorations or for children to make as a Mother’s Day gift. 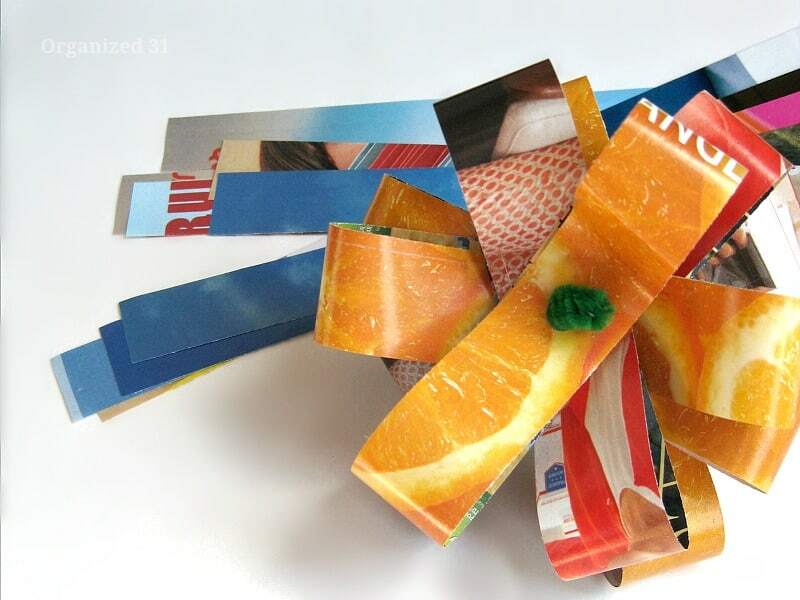 This is a great recycling project to use up those magazines and catalogs you have lying around. 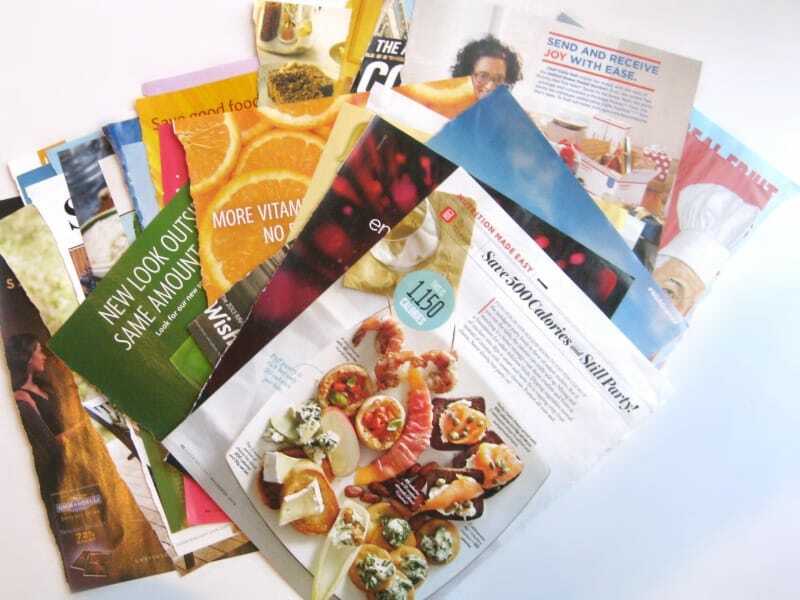 Take the magazines and catalogs and pull out the most colorful pages you can find. The picture isn’t important, you’re looking for bright colors. Text on the pictures is okay. 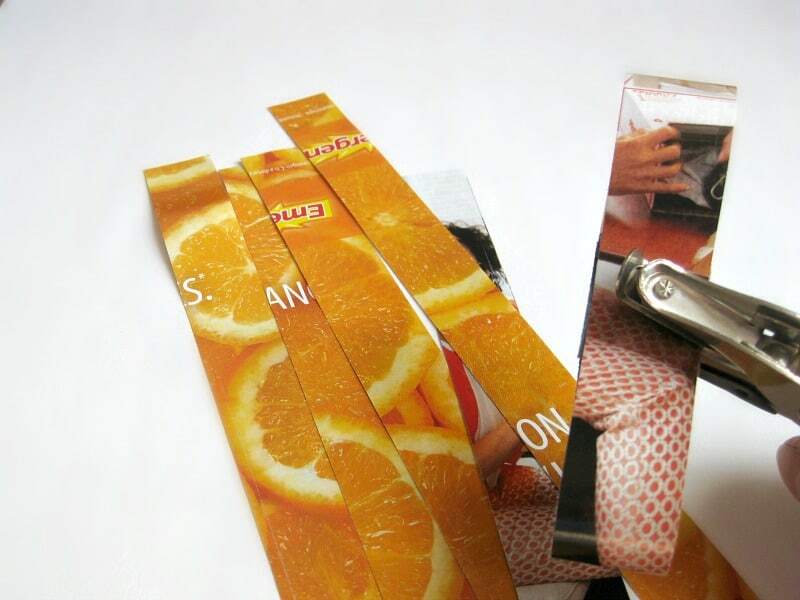 Cut the paper into strips 1/2 inch to 1 inch wide based on your preference. 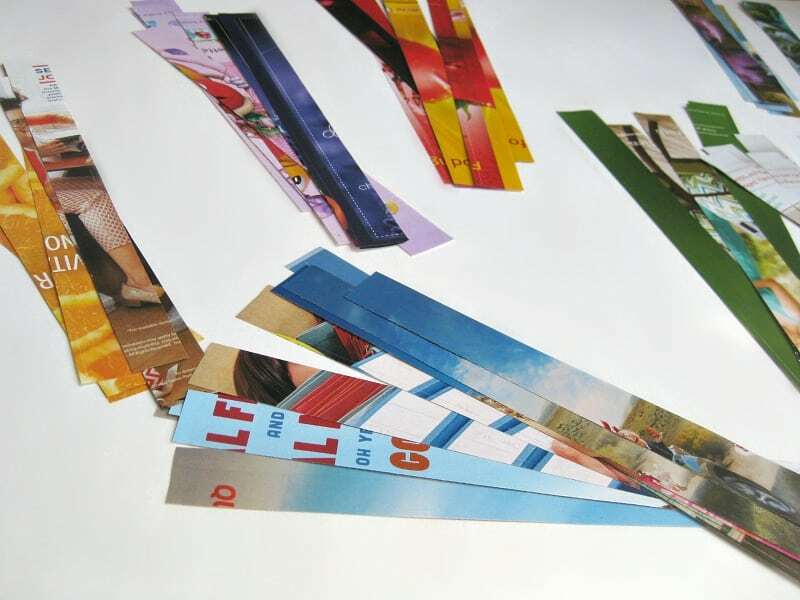 In cutting the paper strips, also consider the picture and any areas you want to cut out or preserve. Sort the paper strips into similar colors. The color groups don’t have to be exact (they aren’t in nature), just similar. Fold the paper strip into a loop and punch a hole in the middle of the loop (be sure to punch the hole through both overlapping ends). 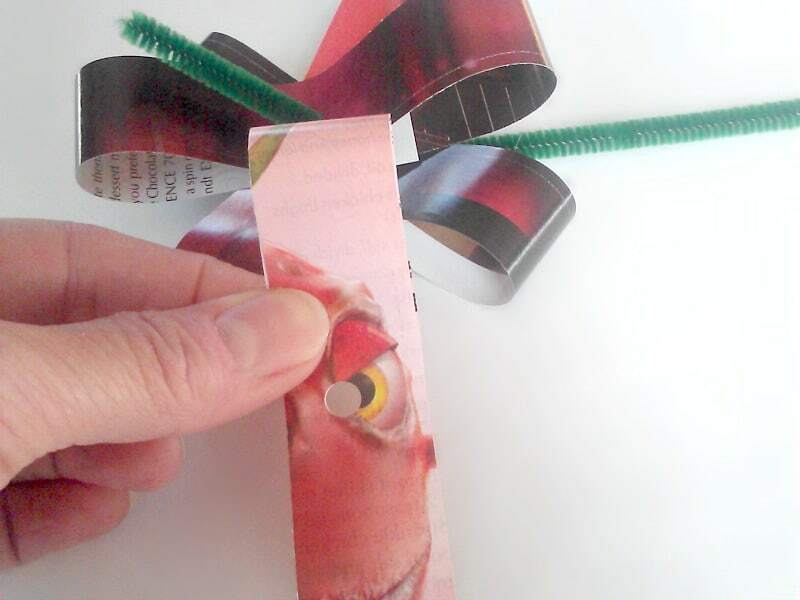 If your paper strip has an eye or face in the middle, sometimes a carefully placed hole will keep it pretty and keep it from looking creepy (Little Shop of Horrors flower, anyone?). Thread a pipe cleaner into the hole. Bend a little ledge into your pipe cleaner to keep the loops from sliding down your pipe cleaner while you’re assembling the flower. Add paper strips until your flower is as full as you’d like. 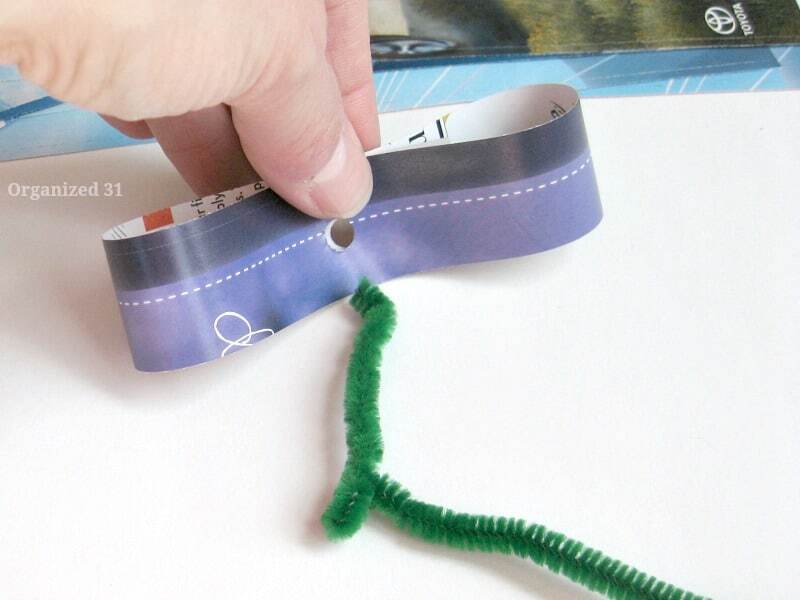 Twist the end of the pipe cleaner into a small loop to hold the paper strips in place. Warning: making these easy magazine flowers is addictive. You can’t make just one. 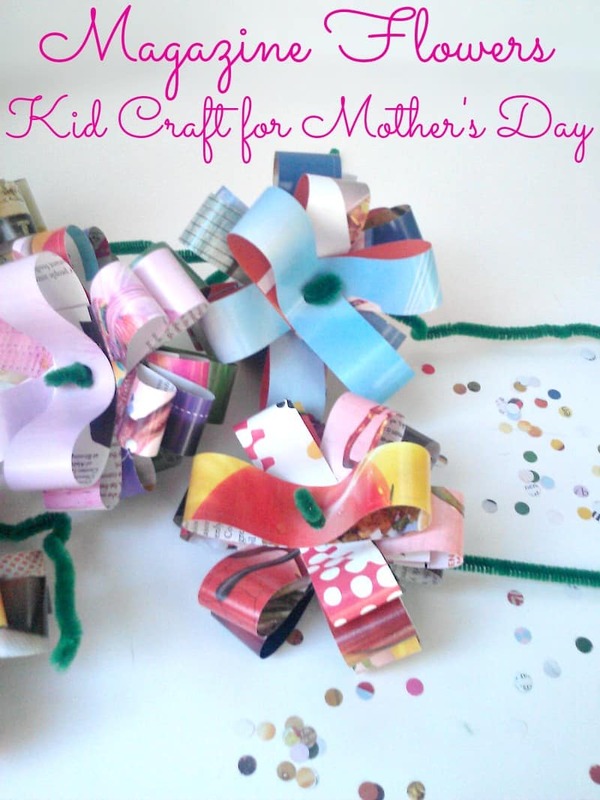 I love this and think it is the perfect Mother’s Day gift for little ones to make. I can also see these being made with Christmas wrapping paper and used on gifts! Great idea! It didn’t occur to me to make them into a wreath (I didn’t get the wreath making gene), what a great idea. I may just have to make my first wreath! So cute! I can’t wait to make these tonight with my little men so they can give to their teachers this week!! Jessica, how sweet. I love crafting with my kiddos, too. 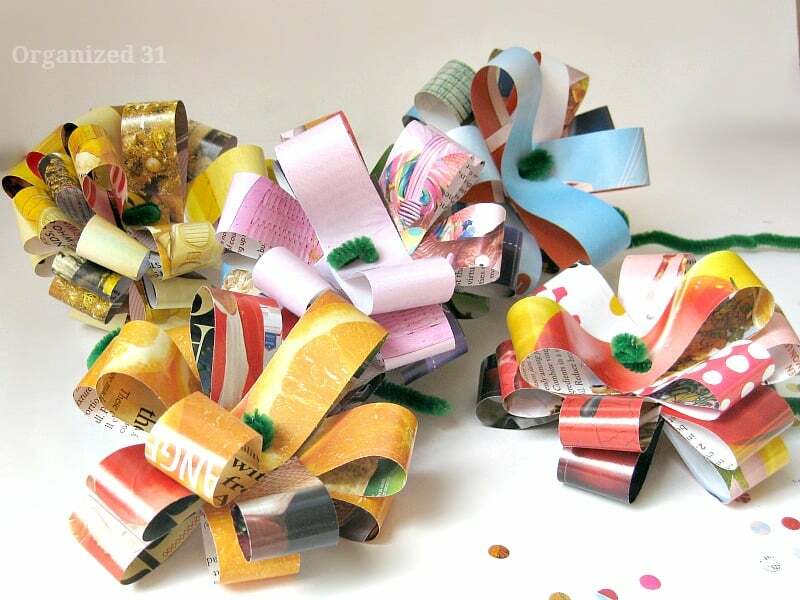 These are so cute and a great way to recycle magazines! They would be great to replace bows on gifts from kids. I was thinking the same thing about using them as embellishments on gift packages (great minds must think alike :). This is great, thanks! I am not an artist, not talented at anything, but I’ve volunteered to ‘art up’ a trash bin for an Earth Day/Spring celebration/Colorpalooza event, and would rather use what I have on hand, so I am thinking of using a stack of old magazines for flowers, butterflies, and (painted) grass around the bottom half, then painting the top half with light blue chalkboard paint and letting the little ones at the event be ‘skywriters.’ Do you have any thoughts about making the ‘grass’?